Diabetes has been reported to be on the rise in many parts of the world. In 2015, the Asia Pacific region alone accounted for 36.9% of the total number of diabetics in the world. This global rise in the prevalence of diabetes will have a significant impact on health care systems, and increase the economic burden of health care in many countries. Prevention and early detection of diabetes are crucial to delay the disease’s progression and its detrimental health effects. For individuals, diabetes prevention includes having a healthy diet, regular physical activity and avoidance of excessive weight gain. National and community programs with multi-stakeholders collaboration will be crucial in raising awareness, enhance prevention. 1. Review the status and prevalence of diabetes and the science behind. 2. Explore prevention and management of diabetes through various strategies on both individual level and community level. The International Life Sciences Institute (ILSI) is a non-profit, worldwide foundation based in Washington, DC, USA established in 1978 to advance the understanding of scientific issues relating to nutrition, food safety, toxicology, risk assessment and the environment. ILSI accomplishes its work through its branches and the ILSI Research Foundation. Established in 1993, ILSI Southeast Asia Region facilitates and coordinates scientific programs, research and information dissemination in ASEAN, Australia, New Zealand and the Pacific Islands. Based in Singapore, ILSI Southeast Asia Region also oversees Country Offices and Committees in Australia, Indonesia, Malaysia, Philippines, Thailand and Vietnam. By bringing together scientists from academia, government, industry and the public sector, ILSI seeks a balanced approach to solving problems of common concerns for the health and well-being of the general public. ILSI receives financial support from industry, government, and foundations. The Clinical Nutrition Research Centre (CNRC) is a joint initiative between the Singapore Institute for Clinical Sciences, A*STAR and the National University Health System. The centre specializes in basic and translational human nutrition research involving studies across the life cycle. These include investigation of the impact of micro-and macro nutrient intake on human physiology, understanding the role of food structure on human nutrition, ingestive behavior and studies of nutritional impact on obesity and Type 2 diabetes. The CNRC’s mission includes development of Singapore’s first Clinical Nutrition Research Centre (CNRC); development of Singapore as the international hub for nutritional sciences; collaboration with food companies; building research capacity and interacting with different stakeholders; and training of the next generation of nutritionists and health researchers. Its vision is to apply cutting edge nutritional science in order to deliver new and innovative solutions to enhance health and well-being. CNRC focuses on nutrition across the life cycle with research areas on infant nutrition, women’s nutrition, nutrition for disease, food nutrient interactions, nutrition in the elderly, pre-diabetic and diabetic diets, and energy balance & body weight maintenance/ weight loss. 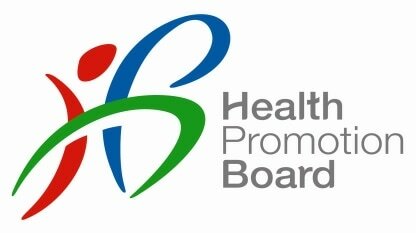 Established in 2001, the Health Promotion Board (HPB) is a government organisation committed to promoting healthy living in Singapore. HPB is guided by evidence-based health knowledge to formulate and implement health policies and programmes that seek to empower the Singapore public with knowledge and skills to take ownership of their health and live a healthy lifestyle. HPB has a range of health promotion and disease prevention programmes such as health and dental services for school children, workplace health programmes and physical activity programmes. HPB also works with the community and initiate new programmes over time to address their health concerns. HPB believes that it can achieve a healthy nation, not alone, but through building meaningful partnerships with individuals, private and community sectors, schools and healthcare providers. HPB’s goal is to increase the quality and years of healthy life, as well as prevent illness, disability and premature death. By 2020, it aims to enable Singaporeans to have access to healthy living at the doorstep of every home, school and workplace, thus making healthy living natural and effortless for Singapore. Click HERE to download the Preliminary Program! Dr. John Agwunobi formally held the United States Presidential appointment of Assistant Secretary of Health for the U.S. Department of Health and Human Services (HHS), where he oversaw the Centers for Disease Control (CDC), National Institutes of Health (NIH), the Food and Drug Administration FDA), and numerous other public health offices and programs. Dr. Agwunobi is currently Chief Health and Nutrition Officer of Herbalife Nutrition. He was also the US state of Florida’s Secretary of Health and State Health Officer and oversaw public health assets in all of the state’s 67 counties, including County Health Departments, laboratories, pharmacy services, AG Holley State Hospital, and Children’s Medical Service Clinics and Provider Network. He also managed the response to Florida’s first-ever intentional anthrax attack, and guided the state’s nationally recognized efforts to protect the state against bioterrorism. Dr. Agwunobi has been the recipient of numerous prestigious honors and awards, including Public Administrator of the Year, APHA Public Health Hero Citation, and Honorary Doctorate of Humane Letters. He also serves as Vice Chair of the Board for the U.S. African Development Foundation (USADF), and Independent Board Director of Magellan Health Services. He achieved M.S. in Public Health from Johns Hopkins University, USA and M.B.A. from Georgetown University, USA. Dr. Agwunobi also completed his pediatric residency at Howard University, and is a licensed physician in Florida, Maryland and Washington D.C.
Dr. M. Balasubramanyam is Dean of Research Studies & Senior Scientist at the Madras Diabetes Research Foundation (MDRF), India, specializing in disease-biology and molecular medicine, as well as omics advancements and signaling in health and disease. Having worked as a Faculty at the Center for Biotechnology, Anna University, Chennai, for 3 years (1996-99) he has joined MDRF in 1999 as Senior Scientist. He is instrumental in setting up the basic infrastructural facilities at MDRF and coordinates various research programmes and educational activities from time-to-time. He is an Elected Member of the Asia-Pacific International Molecular Biology Network (A-IMBN) and had an extensive post-doctoral training (1991-95) at the Hypertension Research Centre, New Jersey Medical School, USA, in the areas of signal transduction in health and metabolic diseases with special reference to molecular pathogenesis of Type 2 diabetes and vascular biology. He is also a Fellow of Andhra Pradesh Akademi of Sciences (FAPASc), Fellow of the Indian Association of Biomedical Scientists (FIABMS) and Secretary of the Madras Science Foundation (MSF) among many other academic roles. He has published more than 110 papers on disease-biology and on molecular pathogenesis of diabetes and its macro and microvascular complications. Prof. James Best is Dean of Lee Kong Chian School of Medicine, Nanyang Technological University, Singapore. He is a distinguished medical leader who has dedicated his career to improving treatments for diabetes and kidney disease. Formerly the Head of Medical School at the University of Melbourne in Australia, Prof. Best has 30 years’ experience in research, teaching and medical leadership. He joined University of Melbourne as Deputy Head of the Department of Medicine and in 1999 was appointed as Professor of Medicine and Head of Department. In July 2007, he was appointed as Head, Melbourne Medical School (MMS) and was responsible for medical education and health and medical research. Prof. Best has taught extensively during his career, especially on the topic of diabetes and metabolism, as well as on the medical interview. His research has involved physiological and molecular studies of glucose disposal, as well as studies of lipid biochemistry and epidemiological and clinical studies of risk factors for cardiovascular disease in diabetes. His current research is predominantly in healthcare delivery for diabetes prevention and management. Assoc. Prof. Grant Brinkworth is a Principal Research Scientist and Group Leader of Public Health Nutrition/Programs at Commonwealth Scientific and Industrial Research Organisation (CSIRO) – Health and Biosecurity, Australia. Assoc. Prof. Brinkworth has more than 17 years’ experience leading large-scale clinical studies evaluating the effects of diet, exercise and lifestyle interventions on human health, performance and functionality in healthy and clinical populations. His research interests include developing and substantiating effective nutrition and lifestyle solutions for weight and metabolic disease risk management and has published over 70 peer reviewed journal papers on this topic. This research has included evaluating the health and safety effects of very low carbohydrate diets and their role for Type 2 Diabetes management. Assoc. Prof. Brinkworth holds a Ph.D. in nutrition and exercise science as well as an MBA degree, and has interests in innovation and the commercialisation of science outcomes and lifestyle programs for large-scale community adoption. Prof. Winnie Chee is Dean at School of Health Sciences and Professor at the Division of Nutrition and Dietetics, International Medical University, Malaysia. She is also currently the President of the Malaysian Dietitians’ Association (MDA) and Key Member of several working committees for developing medical nutrition therapy guidelines for Type 2 Diabetes. Prof. Chee is active in research and publication in the areas of diabetes nutritional management, in calcium and vitamin D in bone health and renal nutrition. She is a prominent speaker in local and international conferences and was the recipient of the 2015 Wimpfheimer-Guggenheim International Lecture Award by the Academy of Nutrition & Dietetics, USA. Prof. Chee received her B.S. in Dietetics with First Class Honours and later pursued her M.S. in Nutrition and Ph.D. in Food Science and Nutrition Universiti Kebangsaan Malaysia. Asst. Prof. Mary Chong is currently Assistant Professor at the Saw Swee Hock School of Public Health, National University of Singapore and a Principal Investigator at the Clinical Nutrition Research Centre and Singapore Institute for Clinical Sciences, A*STAR. She is the Nutrition Lead for the Growing Up in Singapore Towards Healthy Outcomes (GUSTO) study, a mother-offspring cohort study in Singapore and two upcoming cohort studies. She is also Co-Investigator and Collaborator on three adult weight loss dietary intervention studies. Specializing in the area of Nutrition through the Life Course, her main research interests are in maternal and infant nutrition and nutrition related to metabolic diseases and cardiovascular health. She has a special interest in eating behaviour and appetite regulation and has been exploring this aspect in both children and adults in the GUSTO study and weight loss studies respectively. Prof. Chong received her B.Sc. (Hons) Dietetics from Leeds Metropolitan University, UK, and Ph.D. from University of Oxford, UK. Prof. Christiani Jeyakumar Henry is the Director of Clinical Nutrition Sciences at the Singapore Institute for Clinical Sciences (SICS) where he spearheads the translation of nutrition research into food applications, acting as a consultant to global food companies on aspects of food product development with special reference to nutrition. He is a Fellow of the UK Institute for Food Science and Technology and is a Registered Public Health Nutritionist. Prior to working at the SICS, Prof. Henry was the Head of Food Sciences and Nutrition at Oxford Brookes University, UK, and was instrumental in the development and launch of the UK’s first dedicated Functional Food Centre, in his role as Director. Prof. Henry has served on several committees including the UK Committee on Medical Aspects of Food and Nutrition Policy (COMA) panel on Novel Foods, Board member of the UK Food Standards Agency (FSA) and was a member of the General Advisory Committee on Science of the FSA. He was a member of the recent Joint FAO/WHO consultation on fats and fatty acids in human nutrition and has acted as a consultant to FAO, WHO and UNICEF. His major research interests are in energy regulation, functional foods, obesity, glycaemic index, energy and protein metabolism and nutrition in the elderly. He is the Editor-in-Chief of the journal, Advances in Food and Nutrition Research. Prof. Andrew Hills is Deputy Dean Research, Faculty of Health and Professor of Sports and Exercise Science, School of Health Sciences, at the University of Tasmania, Australia. Prior to his current appointment in early 2016, Prof. Hills was Professor of Allied Health Research at Mater Mothers’ Hospital, Mater Research Institute – University of Queensland in Brisbane, Queensland from 2011. His research examines the role of nutrition and physical activity in weight management and in particular, the effect of various diet and exercise modalities on body composition in the prevention and management of obesity and related conditions including type 2 diabetes. He is a Past-President of the Australia and New Zealand Obesity Society (ANZOS), the first non-medical President of the Society and past Co-Director of the Australasian Child and Adolescent Obesity Research Network (ACAORN). Prof. Hills has published in excess of 260 peer-reviewed papers and book chapters plus 10 books in the areas of nutrition, physical activity and obesity. Assoc. Prof. Yuan Kun Lee is Associate Professor of Department of Microbiology & Immunology, Yong Loo Lin School of Medicine, National University of Singapore, Singapore. His research interests include the effect of diet on the cross-talk between the gastrointestinal microbiota and the host, the recycling or removal of carbon dioxide by photosynthetic algae, and microbial fermentation processes in the production of food and pharmaceuticals and in the treatment of waste products. Assoc. Prof. Lee has published 125 papers in international peer reviewed scientific journals, contributed 30 chapters in books, and authored 5 monographs. In addition, he has 3 patents to his name. He is currently President of the International Union of Microbiological Societies (IUMS). Assoc. Prof. Lee is also President of the Singapore Society of Microbiology and Biotechnology, and the Asian Federation of Societies for Lactic Acid Bacteria. He serves on the editorial board of the Critical Reviews in Microbiology (Associate Editor), Scientific Reports, Beneficial Microbes, Bioscience of Microbiota, Food & Health. Prof. Lee received his Ph.D. from the University of London, UK. Prof. Guang Ning is the Head of Shanghai Clinical Center for Endocrine and Metabolic Diseases, Director and Professor of Department of Endocrine and Metabolism in Shanghai Ruijin Hospital, Director of Shanghai Institute for Endocrinology and Metabolism, and Vice President of Shanghai Ruijin Hospital, affiliated Shanghai JiaoTong University School of Medicine, China. Prof. Ning has been focusing on the study of endocrine and metabolic diseases, such as type 2 diabetes and metabolic syndrome, pituitary and adrenal disorders, hereditary endocrine and metabolic diseases caused by single gene mutation, as well as the research on pathogenesis of endocrine related cancers. He is also the Co-Editor-in-Chief of the Journal of Diabetes, as well as the Associate-Editor for four other medical science journals. Prof. Ning received his M.D and Ph.D from Shanghai Second Medical University, China. He was a Postdoctoral Fellow for 2 years in Baylor Medical College, USA. Mr. Geoffry Smith is President of ILSI South East Asia Region based in Singapore, and a member of the Executive Committee of the global ILSI board. In addition, he is the Chairman of the Essential Micronutrients Foundation, a non-profit organization which addresses micronutrient deficiencies globally as a public health issue. He is also Director, Nutrition Strategies International which deals with food and nutrition issues in developing countries. Prior to his current positions, Mr. Smith was the Global Director, Health Chelates for Akzo Nobel Functional Chemicals, and directed the global business for these compounds in food and nutrition as well as pharmaceutical applications. He was responsible for the global project within Akzo Nobel addressing iron deficiency anemia. In addition, Mr. Smith directed the Asia Pacific activities for Akzo Nobel's Innovation Unit. He is a thirty year veteran of the chemical industry in Asia Pacific, and has resided in Singapore for more than 19 years. He is a member of the Nutrition Society of the UK, the American Society of Nutrition and the American Chemical Society. Mr. Smith worked with Akzo Nobel in Singapore and The Netherlands, but is originally from San Francisco, California. Dr. Nese Sreenivasulu is Head of International Rice Research Institute’s Grain Quality and Nutrition Center since 2013 and manages research programs on grain quality. He has 15 years of research experience in plant functional genomics of seed biology. Dr. Screenivasulu provides scientific leadership for IRRI's research on the physical, sensory, cooking and nutritional qualities of rice grain. Leading a team of more than 30 staff members, he is currently focused on exploring the untapped genetic diversity to address grain quality in rice using multidisciplinary genomics strategy. Dr. Screenivasulu is responsible for ensuring that grain quality and nutrition research, as well as analytical services, are fully integrated in IRRI's varietal improvement programs to create product-oriented breeding pipelines that meet the demands of rice value chain stakeholders, and consumers. Dr. Screenivasulu’s published work has gained scientific impact (H-index) value of 34. He has over 75 scientific papers published in higher impact peer-reviewed scientific journals. He has written 18 different book chapters. He serves as an associate editor of BMC Plant Biology, Plant Cell Reports, and as reviewer for more than 20 scientific journals. Assoc. Prof. E Shyong Tai is Senior Consultant at the Division of Endocrinology, Department of Medicine, National University Hospital, Singapore. He is also a Professor at the Saw Swee Hock School of Public Health, National University of Singapore and an Associate Professor at Duke-NUS Medical School, Singapore. Prof. Tai is an Endocrinologist with a special interest in obesity, Type 2 diabetes and dyslipidemia. His work revolves around trying to understand the pathogenesis and the consequences of these conditions with special emphasis on the Asian context. In order to achieve this, he leads an epidemiology program which involves genetic and molecular epidemiology, and outcomes-based research. In addition, he leads a physiology program in adult metabolic disease. Prof. Tai has published over 300 papers in peer-reviewed journals. He is an Executive Council Member of the Asian Pacific Society of Atherosclerosis and Vascular Biology and has also served as a Member of the committees that write the clinical practice guidelines for obesity, lipids and diabetes mellitus in Singapore. Prof. Tai received his medical training at the University of Dundee, UK and was trained in internal medicine and endocrinology at Singapore General Hospital. He completed his research fellowship at the USDA Human Nutrition Research Center on Aging at Tufts University, USA. Mr. Kelvin Tan is Programme Director, National University of Singapore Enterprise and Director, Business Development, Smart System Institute, Singapore. He is actively involved in corporate partnerships with Mercedes Startup Autobahn, Huawei i5 Lab, Bayer Grants4Apps, SIA App Challenge, Shell Idea Refinery and Ikea “Do you Speak Human”. He was one of the initiators for the Modern Aging Singapore accelerator program which inspires startups to develop solutions and products to help the silver industry. Mr. Tan is a visiting Professor with Southern Taiwan University of Science and Technology for Technology and Aging, Taiwan and teaches a similar module in University of Hong Kong. Prior to joining NUS, he was Senior Vice President, New Media/Kodak, at ServTouch Wywy and has co-founded an interactive digital media start-up with a China partner. He has held various management positions in leading IT/Telco companies: HP, M1, AT&T and also Telecom Authority of Singapore. Asst. Prof. Valla Tantayotai is Dean of School of Nursing as well as the Acting Vice-President for Academic Affairs, Office of the President, Walailak University, Thailand. She is also the Assistant Professor at the Walailak University. Her initial 16-year-experiences with a specific focus on increasing self-care ability of persons with diabetes at university hospital contribute to more adaptive approach in working among healthcare practitioners, patients and their families. The practical and experiential aspects of tacit knowledge, Knowledge Management (KM) process and tools inspired Prof. Tantayotai to lead “Diabetes Care Knowledge Management Network” in 2005. It is a structurally untied network which encourages multi-professional healthcare personnel across Thailand to voluntarily gather for a collective learning in order to better their work professionally and spiritually. From 2012 to 2016, Asst. Prof. Tantayotai and the network expanded on the “Community-based Diabetes Prevention Program in Thai Population (Thai DPP)” that uplifts the fundamental mission from diabetes care to prevention. The Thai DPP program uses KM and Participatory Learning approaches to empower IGT individuals to manage their own risks. Asst. Prof. Tantayotai received her B.Sc., M.Sc. and Ph.D. in Nursing Science from Mahidol University, Thailand. Dr. Shyamala Thilagaratnam is Director of the Regional Health & Community Outreach Division at the Singapore Health Promotion Board. She is responsible for developing healthy community ecosystems and implementing health promoting programs in the community. In addition, Screen For Life, the national screening program which encourages residents to go for health screening, in particular for chronic diseases, and breast, cervical and colorectal cancers are also under Dr. Thilagaratnam’s purview. Dr. Thilagaratnam and her team have been developing more integrated and tailored programs to meet the challenges of Singapore’s changing healthcare landscape and an ageing population. Increasingly, the emphasis has been on developing models of preventive care, working with Singapore’s Regional Health Systems and community partners to improve population health through early detection, optimal clinical and lifestyle follow-up, and creating supportive health promoting environments. Dr. Thilagaratnam received her M.S. in healthcare management from the University of Wales, Swansea, M.Med. in Public Health and M.B.B.S. from the National University of Singapore. Dr. Ben van Ommen is Principal Scientist at The Netherlands Organization for Applied Scientific Research (TNO), Director of the TNO Systems Biology Program, and Director of the Nutrigenomics Organisation (NuGO). His research applies systems biology to metabolic health and metabolic disease, focusing on understanding all relevant processes involved in maintaining optimal health and causing specific disease sub-phenotypes, developing new biomarker concepts and personalized health treatment strategies. The aim of Dr. Ommen’s research is to ultimately reshape healthcare in the area of lifestyle related diseases into a lifestyle based healthcare and economy. Asst. Prof. Tong Wei Yew is Consultant and Diabetes Clinical Service Director for the Division of Endocrinology, National University Hospital, and Assistant Professor in Yong Loo Lin School of Medicine, National University of Singapore, Singapore. During his fellowship in integrated diabetes care at the Medical Research Institute, Ninewells Hospital and Medical School, University of Dundee, Scotland, he has worked closely with Dr. Deborah Wake in adapting the ‘Year of Care’ model in Scotland, and also developing the Diabetes Cross-Disciplinary Index Scotland (DXDIS) in collaboration with the Western Diabetes Institute at Western University of Health Sciences, California, USA. He currently leads the Year of Care pilot locally in National University Hospital. He also has keen interests in the area of gestational diabetes/diabetes in pregnancy and the pathogenesis, prognostication and individualisation of treatment in Type 2 diabetes. Asst. Prof. Yew was named the ‘Best Young Educator’ in the Residents’ Choice Awards for two consecutive years in 2013 and 2014. He is currently a core faculty member of the NUHS Internal Medicine Residency Program and Endocrinology Senior Residency Programme. Mr. Yoong Kang Zee is the Chief Executive Officer (CEO) of Health Promotion Board (HPB), Singapore. He has served in various capacities in Singapore Government such as at the Prime Minister's Office, Ministry of Foreign Affairs and Ministry of National Development. Mr. Zee has also worked for a period in the private sector, where he was with Bain & Company subsequently as a management consultant, working on projects in the Heavy Engineering, IT and Fast-Moving Consumer goods sectors. After Bain, Mr. Zee joined Singapore’s National Trades Union Congress, where he founded NTUC LearningHub and the Employment & Employability Institute, also known as e2i. He was then the Deputy Chairman of WSH Council Industry Capability Building Committee since April 2014 and was appointed as the Deputy Chairman of WSH Council Workplace Health Committee in April 2015.. As CEO of HPB, Mr. Zee’s appointment helps to bring greater integration between workplace safety and workplace health initiatives. EARLY BIRD REGISTRATION EXTENDED TO SEPTEMBER 15, 2017! *Symposium rate includes lunches, tea breaks and symposium materials. 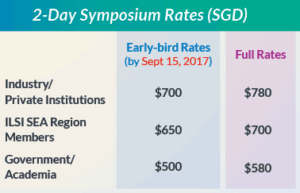 Participants with accepted poster abstracts will enjoy 10% discount off the applicable symposium rate (applicable for ‘Industry/ Private Institutions’ and ‘Government/Academia’ categories only). Interested participants who intend to submit a poster abstract should register by September 21, 2017 and indicate in the registration form of their intention to submit the poster abstract. POSTER ABSTRACT SUBMISSION DEADLINE EXTENDED TO SEPTEMBER 15, 2017! Please click HERE to download the Poster Abstract Guidelines. Kindly click HERE to download the template for your poster abstract submission. Email the completed form to ilsisea@ilsisea.org.sg with the heading “Regional Symposium on Diabetes: Poster Abstract Submission”. 1. All abstract submissions are due September 15, 2017 (*no late abstracts will be accepted*) and must be submitted using the template available to ilsisea@ilsisea.org.sg. 2. Individuals are allowed to submit multiple abstracts. 3. Abstracts submitted for will be evaluated for acceptance by the Organizing Committee. Please be sure to follow the instructions carefully; failure to do so may result in rejection. 4. Accepted abstracts will be published in the program materials. Editorial changes may be made to accepted abstracts at the discretion of the Organizing Committee. 5. All presenters must register for the Symposium and assume responsibility for their own transportation, lodging and registration fees. Presenters who do not register for the meeting by September 15, 2017 will be withdrawn from the program. Using the template available, the abstracts must be submitted to ilsisea@ilsisea.org.sg no later than September 15, 2017. Abstracts must be approved by all authors before submission. Category: The categories are used by the Organizing Committee to arrange the sessions. Check the box that best describes the category for which the abstract is most suited. Introduction: State the reason for pursuing this work. Purpose: State the purpose or objectives of the study. Methods: Describe the methods that were used. Results: Describe the results obtained in the study (2–3 sentences). NOTE: Specific results, with statistical analysis (if appropriate), MUST be provided. A statement of “results pending” or “to be discussed” is not acceptable and will be grounds for abstract rejection. Results should be summarized; do NOT use tables or figures. Significance: State the significance of the findings to public health (1–2 sentences). A short acknowledgment of support can be listed, if applicable. Accepted poster presentations will be automatically entered for consideration for the best poster presentation award. Winner of the awards will be announced before the closing of the final day of the symposium. The prize of the award will be informed prior to the symposium before the abstract submission deadline. To book an accommodation with the Grand Copthorne Waterfront Hotel at the special rates mentioned, please click HERE!